Earlier on our trip Jessica and I spent a week on a “cruise” up the river to Pucallpa from Iquitos in the Peruvian Amazon, on a three story river boat (think Mark Twain Mississipi but made entirely of steel and without the paddle wheel). The galleys of the river boat were crammed with 250 passengers, but the large open deck was a beautiful place to exercise for the few hours a day when it was not being scorched by the sun. The boat also had refreshingly cool showers with unlimited water piped straight from the river. Ahh. Jessica and I traded in our eight hours of paddling a day for several sessions of acrobalance and acroyoga, as well as one hard workout a day. These six days were very exciting for us as we discovered a lot of new poses and transitions in acrobalance and acroyoga. If you haven’t heard of acrobalance or acroyoga, I hope this post serves as an enticing introduction. If you are already familiar, I hope to share a little of what I have discovered. Adagio is the art of poses and movements performed by balancing the bodyweight of two or more people against each other. 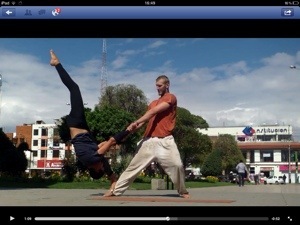 Adagio includes partner hand balancing and acrobalance. The former involves a lot of handstands and the later involves anything else you can think up which is possile with two or more people but not with one. Acrobalance is a form of adagio in which the position of the base varies from standing, squatting, kneeling, quadruped, etc. It shows up a lot more in the circus and performance arts while acroyoga tends to runs with the yoga and thai massage crowd. (Not that these are mutually exclusive). Acroyoga is essentially a form of acrobalance in which the base is almost exclusively supine (i.e., lying face up). Acroyoga practitioners will explain that there is a lot more to it than this, but this is the most immediately obvious distinguishing feature. Jessica and I enjoy both acrobalance and acroyoga together. (Neither of us are proficient enough with handstands for anything more than the most rudimentary hand balancing). As a base I find acrobalance to be stimulating but extremely taxing (think of a squat workout in which the barbell is moving around in all directions) and acroyoga to be more relaxing (after all, I am lying on my back the whole time). There are three major attributes that I enioy about these partner balancing shidigs. 3. Only be achieved by communicating closely with a partner and building on each others strengths. If you haven’t tried acrobalance or acroyoga, I encourage you to do so. Jessica and I started on our own by copying youtube videos. After a month or so of trying to copy the most talented circus performers in the world, we decided to take some classes. We took an acroyoga class with Jeremy Simon, one with Natalie Weinstein, as well as an acrobalance class with Zac Diener. The influence of teachers and peers was enormously helpful. Learning the basics seemed a bit tedious compared to the complicated things we had been attempting, but once we began laying the foundation we progressed rapidly. The environment was supportive and creative and we highly recommend looking up any of these teachers if you are in the Bay Area. To assist with teaching, I added a scoring system for the difficulty and the skill requirements so I could quickly find the poses that would play to the strengths of a student (e.g., as identified in a movement screen). I also used this database to catalogue new poses that I had only imagined; the systematic classification itself brought my attention to areas which were underdeveloped, resulting in the creation of new poses and transitions. Here is a screenshot of my database. At this point the spreadsheet is more of an idiosyncrantic intellectual tool for me so I don’t expect it to be intuitive. 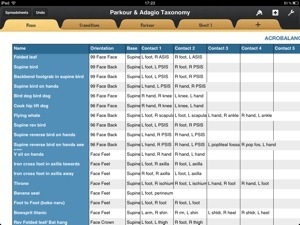 I do hope that sharing the practical applications of this database will be helpful to others down the road. Please don’t hesitate to contact me if you are interested in exploring and improving this database. 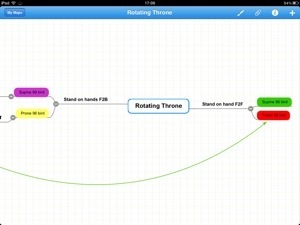 In addition to the spreadsheet I made a mind map of the acroyoga transitions using mindmeister on the ipad. (As if things couldn’t get any nerdier. )* By mapping all of the connections I discovered that one could connect any two poses in acroyoga no matter how disparate they might seem with only a small handful of transitions. This discovery and the mastery of these connections was a breakthrogh in our acroyoga practice and led to longer and more complex combinations with a freedom and confidence that we did not have before. Without more pictures this description is gettting tricky so I think I will save an elaboration on my “model of acroyoga transitions” for a later post. I am excited to order the new Acroyoga flight manual as soon as I return to the States so I can update my database with the commonly used terminology and pose descriptions. Nothing hinders collaboration like a lack of common vocabulary. Furthermore, Jessica and I are excited to be participating in an acroyoga weekend long festival called Divine Play taking place at Fort Mason in San Francisco October 12-14. Thos festival is open to all levels and based on my interactins with the acroyoga community thus far I am expecting it to be a welcoming, friendly and fun environment to learn. I am excited to see what we will learn from expert teachers from around the world. I suspect that much of the “discoveries” we have made by groping around in the dark during our travels will turn out to be common knowledge. 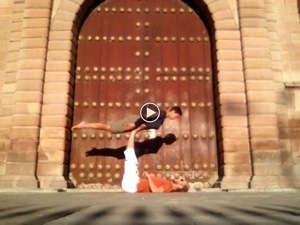 This entry was posted in Acrobalance & Acroyoga, Partner Workouts: Gravity and Rope. Bookmark the permalink.